Just look at them....OUR FAMILY. Full of hopes and dreams and schemes for a new start in Indian Territory. My best guess is that this was taken near Poteau, Spiro, Cameron, Kully Chaha. And the year is probably about 1892. None of these in this group are still with us. If you can help with the identification, please do so by going into our contact page and send us a note so we can update our information. We are only certain that the back center are Missouri and Moses Greenworth Poole. Fairly sure that the young girl in the front center is Mary Lee Verna Poole, who grew up and married Carrol Sharp. William Sharp married Lenora Poole on 12 December 1893, Their first child was Eules Velmer. He was born in 1898 and died in Booneville, AR in 1974. Then they had Molly Rose Della in 1900. She died in 1963. In 1902 they had Ruth Delma. She died in 1980. Gussie Matilda was born in 1907 and died in 1986. Alice Alvina was born in 1910 and died 2001. Ella Audrie was born in 1912 and died in 1993. Letha Lenora was born in 1914 and died in 1991. Lavada Mae was born in 1917 and died in 1996. Then came Adaline Pauline in 1920 and died in 2001 Omer Hoyt was the first born in about 1895. He married Clara. They appear in 1920 and 1930 Census in Poteau. In 1930 they have Wesley, Hoyt, and Warner. Carroll Louis (Fuzzy) Sharp married Mary Lee Verna Poole. Everyone called him Fuzzy. They married in 1899 in Booneville, Logan, AR. They are both buried in Woodlake, Tulare, California. They had Verb in 1901. He married Nancy Taylor. He was born in Indian Territory, around Poteau. Vas came next in 1903. Mirl was born in 1907. Eva was born in 1910 and Oscar (Bawley) was the baby, born in 1911. Vas ,married Lacy Barton, Mirl married Mark Hays, Ev married Paul Morgan and Bawley married Anne Maurer. Daniel Buster Pool was born October 12, 1889 in Boonville, Arkansas, to Moses Greenworth Pool and Missouri Eddy or Missouri Eddy Hall. He married Mary Belle Harrell 9 July 1911. I cant tell if they married in Gertie, Oklahoma.. They had Robert Daniel. Robert got whooping cough and the doctor gave him the wrong medicine. He died after about 45 minutes. Pallie Ellen, in 1912 Leslie in 1915, Edward John, in 1918, Florene Ellen and Lorene , in 1922.. Dan died around Marlow, Oklahoma in 1974. His granddaughter, Reta shares that he was a small man. He wore a size small in clothes and a size 6-7 shoe. He was born at seven months and never fully developed fingernails. He had no eyelashes and only a small amount of eyebrows. He loved making people laugh. On his 80th birthday, Reta went to give him birthday money and found him drunk as a skunk. Dan shared with Reta his memories of his mother, Missouri, dying. He said she had been out digging potatoes with her hands. 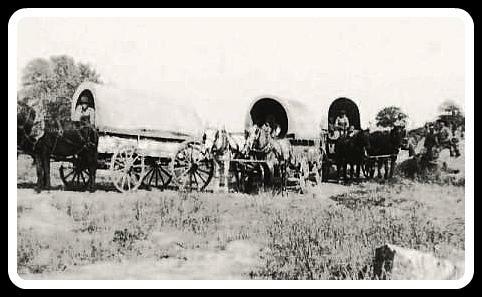 They lived East of Comanche and always had a garden. Later that night she began passing blood and she bled throughout the next day and then died that night. He said he was the first one to toss a handful of dirt into her grave and then all the kids followed. He shared about living in Eastern Oklahoma that they always tried to live near a creek and always had a garden. Indians would come in the night and steal from their garden. They lived in a dugout and he liked summer much more than winter because hed almost freeze in the winter. In the 1920 Federal Census for Poteau, Leflore, Oklahoma you can find a bunch of the Pools and Sharps. They were just about all there, including some of the names I used to hear as a child. Friends.....like the Hales and Weddles. They show up in other places in Oklahoma where I find Sharps and Pools. I guess when one of them found work, they all went. I found Verb Sharp listed as Virba A. He is 19 years old. I know that he and Nancy got married in the Fall of 1920 and he said he was 21 but according to this Census report he would have been 19 when they married. All of his siblings are at home in this census. His dad, Carrol is listed as Carl, age, 40. His mother, Vernie is 38. Verb 19, Vas is 16, Mirl is spelled Myrle L and she is 12, Ev is 9 and listed as Ervie A. Oscar V is 8. Looking at the pages before and after, I found Tyford Pool and Molly with most of the kids. Emit is missing but found him nearby with his young wife Doris and their first baby, Stella is four years old. The rest of them are all at home. I will spell them here as they are in the record. Osie D is 21, Chester M is 19, Clarence A is 18, Bertie L is 15, Berthie M. is 13, Baley is 11, Hubert is 9, Orval is 4, and Crawford is 1. Then a ways up the road I see Manuel C at age 34 and Lucy is 24 and the two older boys Loyl and Garvin. Near them I found Will Sharp 44 and Lenora 45. Lenora was one of Moses Greenworth Pools daughters. They have Della R 18, Ruth D 16, Gussie M 12, Alice 10 ,Ellie A 8, Letha L is 5 and Lavada is 3. Then finally I find Moses Greenworth and Amanda .....he is listed as Green. He is 66 and Amanda is 46. They have one child at home.....Allen is 2. 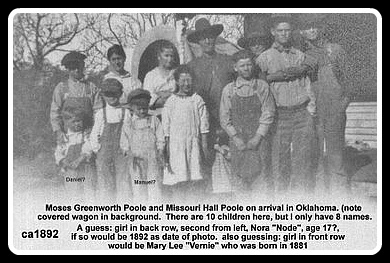 So after Missouri's death East of Comanche, Oklahoma, Green went back to Poteau and married Mandy there.